From forbidden to featured for breakfast, grapefruit is a young fruit with a rich history as a popular citrus and an uplifting essential oil. First known as “the forbidden fruit”, grapefruit is a 300-year-old citrus hybrid known for its fresh, uplifting fragrance and sweet-tart flesh that is rich in vitamin C and lycopene. A fresh, uplifting citrus oil to rejuvenate both the body and the emotions. We use grapefruit in our blends to is used to invigorate circulation, tone the skin and to soothe a troubled mind. Grapefruits were first discovered in Barbados in the 1700s, where they emerged as a hybrid of sweet orange and pomelo, both species that had been brought to Barbados from Asia. Grapefruit trees were brought to Florida in 1823, and are now widely grown in Florida and Texas, as well as many other citrus-growing areas around the world. Grapefruit trees need warm temperatures, night and day, and grow best in temperate or tropical regions of USDA hardiness zone 9 and up (where the coldest winter days don’t ever go much below freezing). China, the United States, and Mexico are the three largest producers of grapefruit in the world. For the first 100 years after discovery, botanists frequently confused grapefruit with the pomelo, and with good reason: they do look very similar. For easy reference, pomelos have a greener rind, are larger than a grapefruit, and have very, very thick rinds and a large amount of pith (the white tissue under the rind). By the 19th century, grapefruit took on its current name because of the way grapefruit grows in grape-like clusters – sometimes of 10 to 20 grapefruits at once. Grapefruit trees look much like orange trees. A mature tree can be 4.5 to 6 metres (15 to 20 feet) high, with dense, shiny, dark-green leaves. Grapefruit will bloom and produce fruit year-round. 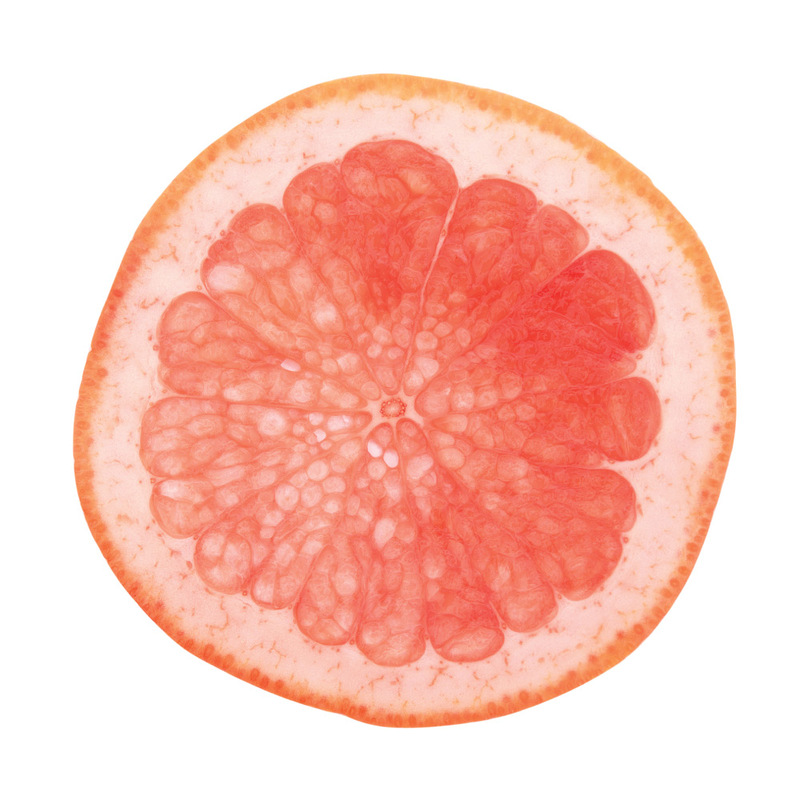 Ripe grapefruit can be 100-150 millimetres (4 to 6 inches) across, depending on the variety, and the sweet, mildly acidic flesh ranges from pale pink to vivid magenta, depending on the variety. Grapefruit is a popular breakfast fruit around the world, and is also beloved for its tangy juice and zesty, uplifting essential oil. Sweet, tart grapefruits are fat-free, low-calorie, and an excellent source of vitamin C. Pink grapefruit also contains the antioxidant lycopene (also found in tomatoes and watermelon). While eating grapefruit can be beneficial for many, they do come with an unusual caution. Grapefruit and grapefruit juice can interact with medications in two ways: by blocking an enzyme that helps break down medicine in your body, so you wind up with too much medicine in your bloodstream; or by preventing absorption of the drug in your intestine so you don’t get the benefit of the drug. It doesn’t take much, either: as little as one grapefruit or a 200ml glass of grapefruit juice can cause a problem with certain drugs. Drugs that negatively interact with grapefruit should be marked on the label, but if you are concerned, check with your doctor or pharmacist. Similar to lemon essential oil, grapefruit essential oil is cold-pressed from grapefruit peel. This bright, citrusy oil has been traditionally used to boost energy levels with its uplifting and cleansing aroma. Grapefruit essential oil is not thought to interfere with medications in the same way as eating grapefruit, but it’s a good idea to check with your doctor before using. When the grapefruit was first described by the Reverend Griffith Hughes in 1750, it was called “the forbidden fruit”, in reference to the original fruit tree that tempted Eve in the Garden of Eden. Grapefruit does come from a paradise: Barbados. In fact, grapefruit has been named one of the “Seven Wonders of Barbados”. In Ayurvedic medicine, grapefruit is thought to increase pitta energy, and pacify kapha. Inhaling grapefruit essential oil is said to stimulate the heart, solar plexus and third eye chakras. It helps to cleanse the mind and the aura, and stimulate confidence, intelligence and creativity. According to Ayurveda, grapefruit essential oil can boost energy and improve mental strength, and help to burn fat. In Traditional Chinese Medicine, grapefruit is classified as a sour food. Sour foods are thought to be astringent, cooling, and to help generate yin. Sour flavours are associated with the liver and spirit, and thought to help digestion in small amounts. Grapefruit is a relatively young addition to the citrus family tree. They are a hybrid of the sweet orange and the pomelo which was discovered in Barbados in the 1700s. At first, they were called shaddocks, after a Captain Shaddock who brought citrus trees from Asia to Barbados. Grapefruit became popular in the Caribbean, and by 1823, grapefruit trees were brought to Florida by Count Odet Philippe. At first, grapefruit trees were a novelty, but by 1870 the first commercial grove was planted. The demand for grapefruit steadily grew, and by 1940, the United States had a large grapefruit industry. Grapefruits were also cultivated in Jamaica, Trinidad, Brazil and Israel. The demand for grapefruit was helped by the “Grapefruit Diet”, also known as the “Hollywood Diet”, which became popular in the 1930s, and has gone in and out of fashion ever since. The Grapefruit Diet called for eating grapefruit (and not much else) three times a day. If you’ve seen the Darren Aronofsky film “Black Swan”, you may remember the Grapefruit Diet in action when ballerina Nina is seen eating a grapefruit for breakfast. While the Grapefruit Diet is extreme, grapefruit themselves (eaten as part of a healthy, varied diet) are very good for you, and their popularity has grown throughout the 20th century.